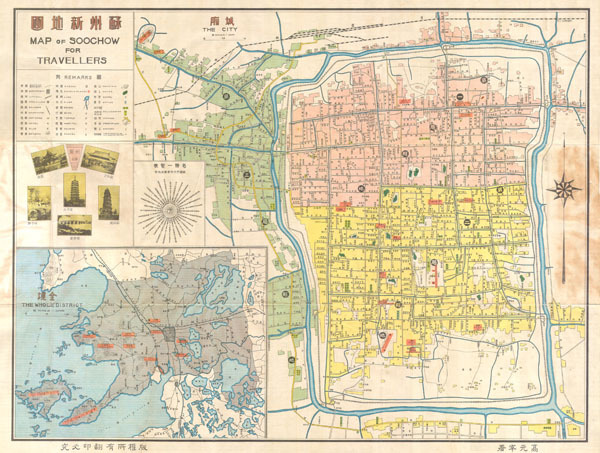 This extremely rare map is a street plan of Soochow ( Suzhou ) China. Published by WenYi press of Suzhou. Suzhou was the cradle of the Wu Culture and is today one off the most beautiful and interesting cities in China. All text is in Chinese save for the map's title, which is in English. Detailed to the street level. Issued in pocket format and folds into its original cardboard binding boards. Verso contains statistical and historical information in both Chinese and English. Very good condition. Folds into original covers. Minor staining. Good margins. Text on verso.